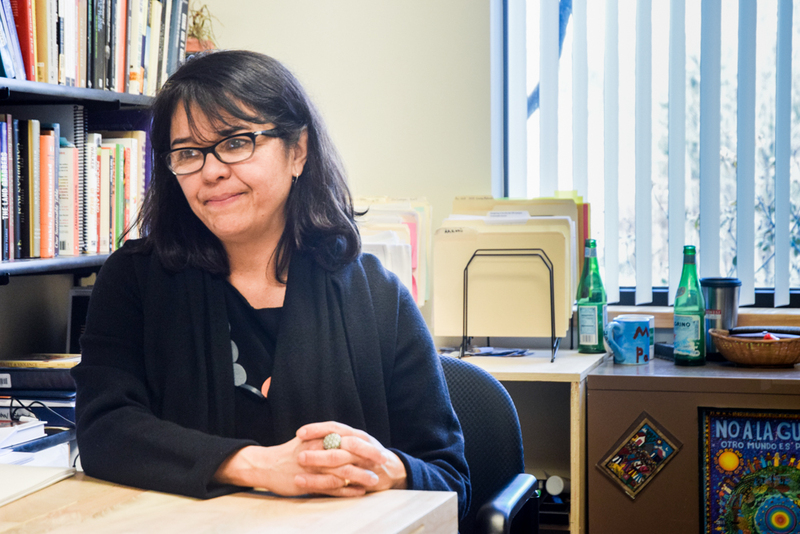 Cecilia Menjívar is the co-director of the Center for Migration Research and professor in the sociology department at the University of Kansas. She studies immigration, migration and how immigration laws affect the lives of immigrants and non-immigrants alike. The Wire: In your research, what are some of the ways you see government and other organizations affecting the everyday lives of the people you study? Professor Menjívar: In everything. Everything is so informed and so affected by legal status, not citizenship status necessarily, but legal status. Access to schools, to health care, to driver’s licenses and IDs. Whether people are going to be more isolated, or are going to be able to be part of communities. It’s mostly because not having legal status also means not being able to get a driver’s license, whether people are going to be able to drive or not to employment, and for many people not being able to attend college because they can’t pay in-state tuition. A lot of people avoid spending time in public areas. So that affects friendships and there’s even research that shows that all of that affects whether people are willing to date. Sometimes they don’t want to disclose their status because of the stigma they feel, especially among young people. Professor MenjÍvar spoke with The Wire in addition to giving a publicly attend- ed talk titled “Law, Media, and the Criminalization of Immigrants: Constructions and Consequences” on February 28. There’s so many components to the immigration enforcement side, but also the legislative side that regulates family immigration. They continue to reduce opportunities for immigrants to become legalized. At the same time, the enforcement side has grown so much to go after immigrants who cannot be legalized. Q: What are some of the key ideas in your talk that you would encourage people who can’t attend to ponder and research? A: To think about how we tend to think that from the media or from politicians we think that immigrants, undocumented immigrants are committing crimes or they might commit crimes, and I would invite them to take a more critical view at that and think about how those immigrants have been created, how their legal status has been created through law and how laws have included and excluded, and made their lives irregular. To keep a critical stance about what people hear in the news because there’s quite a bit of construction of immigrants in the news. Construction about criminals but also assertions about immigrants that are supposed to be very good. Keep that in mind. Q: What would you like to see from the media when they run stories on immigration? A: You want media reporting to have some context and not just to repeat what politicians say using the same terms, the same language. You want media reporting to be a little bit more in-depth and cautious, to provide more context, information and history. What you want is not just the agitation that comes from some media reporting that repeats particular terms and makes everything look so ominous and dangerous. Q: Do you see the federal laws being passed and the portrayal of immigrants in the media as going hand in hand, or does one tend to follow the other? A: It’s very difficult to disentangle that. We’re trying to do that in research actually right now. At this moment I would say they go hand in hand. They support each other. We don’t know yet what comes first. If it’s the media reporting, then the public reacts, and then they ask their officials to do something, or if it’s the officials who start out, then the media reports, and then the public gets upset. Q: What do you think are some of the most promising solutions to and areas of progress in the issues you study? A: It’s not just fixing the immigration problem, because that phrase that you hear about the broken system…the system needs to be redrawn not just to be fixed. You know, I don’t see progress. That’s my problem right now. Hopefully things will be different soon but right now from what I see they don’t seem particularly optimistic. Q: In that case, what are some of the specific areas you see the most regression in? A: We are at a point now where it is difficult to to be to be optimistic because things could have changed course maybe ten, twenty years ago, but now the immigration system is already very well developed and very well set. And there’s so many aspects to it, and all kind of point in the same direction. So it’s not that we have gone back, it is that we have never changed course. Everything has been built on what’s already there. Q: Can you identify any fundamental decisions or turning points that set us on our current path? A: I think decisions were made in the 70s and definitely in the mid 80s that started us on this course. It’s been already quite a bit of time. The 1986 law it started on the path to criminalize immigrants, and then the ‘96 law, and then from there on it’s being more and more of that, amplifying the criminalization of immigrants. With every law that has been passed there’s been more and more of that. Q: Walla Walla in particular has a lot of migrant and undocumented families. I was wondering about some of the difficulties those students are more likely to experience at home and in school and how that plays out in their academic and social life. A: I think what research has found in other places is that it’s an every day challenge to know that there’s a part of them that they could lose at any moment if they have an undocumented parent or they’re undocumented themselves. There’s stigma as well. So it’s a combination of fear and stigma and always being vigilant about what may happen. Q: In what ways do you suggest people further educate themselves about this topic and also make sure they do not contribute to the problems you study? A: There are groups on campus I think that are leading the way to educate others about immigration. They can read, they can take courses on immigration. You’re professor here, [Aaron Bobrow-Strain], has some very interesting works that can help. Q: In addition to critically evaluating our news and awareness of our own language, what other concrete steps would you recommend people do to improve these issues? A: I think the more people educate themselves the better voters they’re going to be. And they can vote for officials who are to take a more balanced or just position on immigration. But I think people have to be educated themselves to be able to vote and recognize which officials will do what.